Rings of size <8 cannot turn inside-out, meaning that configurations of substituents relative to each other are locked. The simple way to say this is that it leads to the existence of cis and trans isomers for the disubstituted cases ( sometimes called “geometric isomers”) – e.g. cis– and trans- 1,2-dimethylcyclohexane. The most stable conformation of cyclohexane is the chair conformation in which all the groups along each C–C bond are staggered relative to each other. In the cyclohexane chair, there are two orientations of substituents on tetrahedral carbon: straight up/down relative to the ring (“axial”) and in the plane of the ring (“equatorial”). Cyclohexane chairs can undergo “flips” whereby all equatorial groups become axial and all axial groups become equatorial. 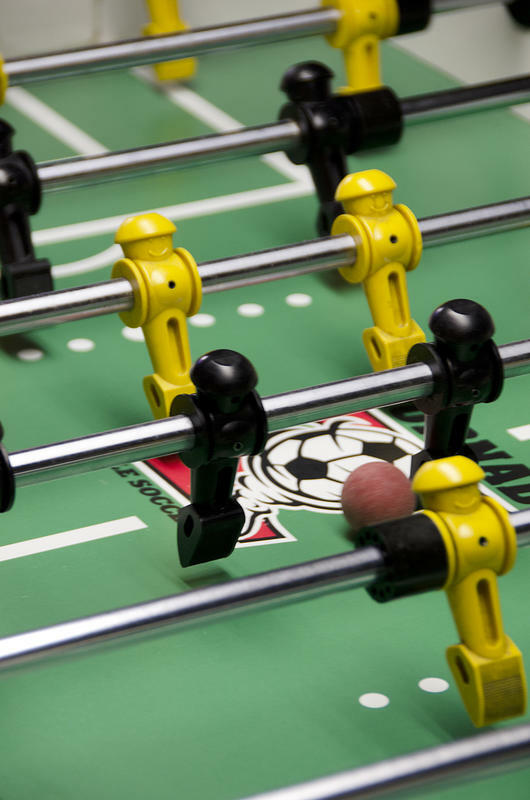 This occurs rapidly at room temperature – so rapidly that in most cases at room temperature, the signals corresponding to each individual chair cannot be observed by our most useful tool (NMR spectroscopy) – instead, an average is observed. The activation energy for a chair flip is about 10 kcal/mol, since in order for a chair to “flip”, the molecule must pass through the strained “half-chair” conformation (about 10 kcal/mol higher in energy than the chair). Axial substituents lead to greater torsional strain than equatorial substituents, since they experience two additional “gauche” interactions with the hydrogens on the ring carbons located two bonds away. Another way to look at the same phenomenon is to think of the axial group interacting with each of the axial hydrogens (“diaxial” interactions). For methylcyclohexane, the conformation where methyl is axial is 1.70 kcal/mol more unstable than the conformation where the methyl is equatorial, a number referred to as the “A-value” for CH3. A-values have been measured for a large number of mono substituted cyclohexanes. In particular, the A-value for t-butyl is so high (>4.5 kcal/mol) that cyclohexane rings with a t-butyl substituent are essentially “locked” in the position where the t-butyl is equatorial. A-values are additive. With di- and trisubstituted cyclohexanes, we can use A-values to determine which chair conformation is most stable. The stereochemistry of fused rings can have a huge effect on the shape of the molecule. In cis-decalin, the molecule adopts a “tent” or “cup” shape where there is a concave and convex face. Trans-decalin is much more flat. Additionally, cis-decalin can undergo chair flips on each of its cyclohexanes, but trans-decalin is “locked” in position since a ring flip would lead to too much strain (essentially this would create the equivalent of a trans-double bond in a six membered ring, which is too unstable to form). “Bridged bicyclic” and “spiro” ring junctions are also possible. 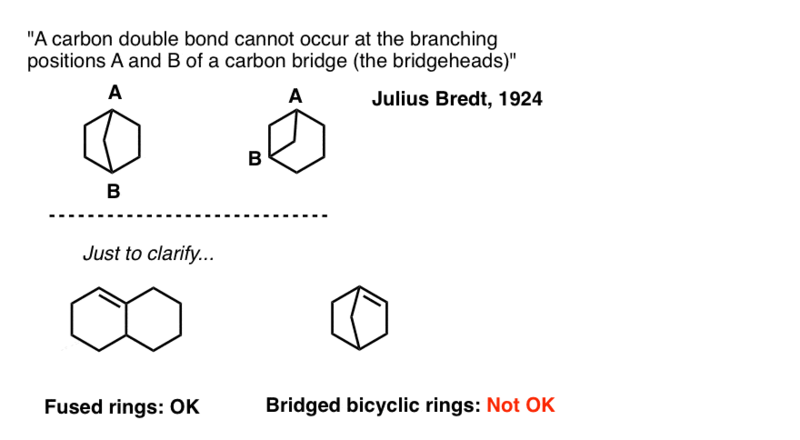 In bridged bicyclic molecules, the two bridgeheads are separated by “bridges” containing at least one carbon. In “spiro” fused molecules, the two rings are both joined at the same carbon. Again, even if you are a genius, it would have been extremely difficult, if not impossible, for you to predict all this behaviour based solely on knowing the rules of chemical bonding. Many of these phenomena were first observed experimentally and the explanations provided post-hoc. That’s why I keep repeating the reminder that organic chemistry is very much an empirical science. A double bond cannot be placed at the bridgehead of a bridged ring system unless the rings are large enough. Let’s go through this. Imagine drawing a version of bicyclo[2.2.1]heptane (also called “norbornane”) with 1 double bond. 3 different constitutional isomers are possible. But only one has ever been observed. This observation came to be known as “Bredt’s rule”. Note that no deep explanation was offered at the time – merely the observation that these bridgehead double bonds do not form. 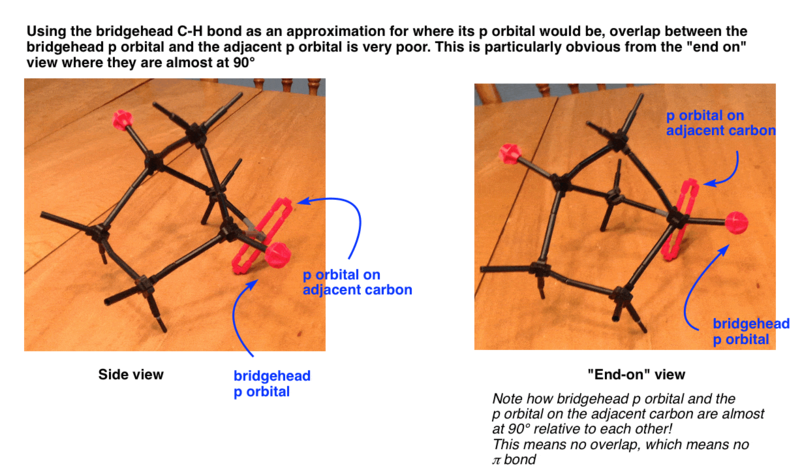 Looking at a model, and knowing what we know now about bonding, especially that of π bonds – can you think of a reason why bridgehead alkenes might be unstable? Remember what is required in order for a π bond to form – we require overlap between the two adjacent p orbitals. In other words, they must be in the same plane, lined up like the plastic men on a foosball table. Look closely at the bridgehead C-H bond in the model above. Note how it’s almost sticking straight out to the side of the molecule, especially with respect to the C-H bond on the adjacent carbon. The normal geometry for a sp2 hybridized carbon is trigonal planar. However, due to the constraints placed on it by being part of multiple rings, the bridgehead carbon becomes “pyramidalized”, that is to say, somewhat like a pyramid (non-planar). In other words it has a very atypical shape for an sp2 hybridized carbon. I didn’t show what the overlap in the other possible constitutional isomer would look like (the third case in the second diagram, above) but trust me when I say that the overlap is even worse. So the bottom line for today is bridgehead double bonds are unstable due to poor orbital overlap. Here endeth the lesson for the vast majority of readers. However, if you’re interested, you can continue reading to learn about how our understanding of Bredt’s rule has evolved since 1924. What gives? These molecules are clearly stable. Why might bridgehead double bonds be allowed in these cases, but not in the case of norbornene, above? It has to do with the greater flexibility that accompanies larger ring sizes. It turns out that the stability of bridgehead double bonds roughly mirrors the stability of the largest trans-cycloalkene that contains the double bond. Neither trans-cyclohexene nor trans-cycloheptene are stable enough to exist at room temperature (too much ring strain); nor have the bridgehead alkenes in a parent ring of 6 or 7 been observed as anything other than transient intermediates. However, trans-cyclooctene is a stable molecule – and likewise, bicyclo[3.3.1]non-1-ene is a stable compound.. Observing bridgehead double bonds in molecules with parent ring sizes of 9 (CP-225,917) and 10 (Taxol) is therefore to be expected, since trans-cyclononene and trans cyclodecene are stable molecules, as are all the higher cycloalkenes. If you are still reading this, you must be a nerd, so one last wrinkle. Amide bonds are generally difficult to break – certainly much more so than those of esters or acid chlorides. This is a good thing for us – strong peptide bonds make for stable proteins. One of the reasons is the considerable double-bond character between C and N as shown in the right-hand resonance form, a consequence of nitrogen’s considerable electron -donating ability. What happens when the nitrogen is at a bridgehead, especially in a small ring system? Needless to say the overlap between the lone pair on N and the carbonyl nitrogen is now extremely poor. This results in a considerably weaker C-N bond, one that is very easily cleaved by moderate nucleophiles. In 2006 Brian Stoltz’ group at Caltech succeeded in isolating the HBF4 salt of the bridgehead amide above. Short and interesting paper. Note 2: In fact, double bonds of this type are predicted to have “diradical” character. Attempts to form bridgehead double bonds in rings of sizes 6 and 7 are often accompanied by phenomena such as dimerization and trapping of O2, which are clear indicators of radical intermediates. Which Cyclohexane Chair Is Of Lower Energy? I have a doubt. Can carbanion be formed at bridgehead position of [2.2.1]bicyclo heptane? Not easily. If there is a bromine at the bridgehead position, you could reduce it off with sodium metal, but the resulting anion will not be very stable. Just curious but what if we compared the stability of bicyclo[2.2.2]octane vs bicyclo[2.2.2]oct-2-ene? Which would be more thermodynamically stable? Thanks, funny quote in between.